Norman Feller may have got his start by DJing hard trance and rave in the final days of the 80’s and early 90’s, but his first forays into production under guises such as Phasis, Watchman, Norman and Smash would pale in comparison to the moniker he established in 1995. As Terry Lee Brown Jr. he bridged the worlds of house and techno with such finesse that many DJs and producers expressed genuine shock when they found out that the producer with the American afro-centric name was not just white but also from Germany. One of the most prolific producers in his field during the last half of the 90’s, Feller has released nearly two dozen singles and a half dozen albums as Terry Lee Brown Jr. alone. Under alternate aliases like Da Kine and Fonka Delix he has been responsible for classic moments in deep house and tech-house via his Driftwood and Tonika labels he ran with long time friend Frank Cochois, aka The Timewriter. With many other projects constantly on the go including his annual mix compilation, Terry Café, it is somewhat of an understatement to say that Feller’s contribution to electronic music has been considerable. Ahead of his performance at this year’s MUTEK festival, held from June 1-5, LWE caught up with Feller to discuss his dedication to releasing music in long form, the importance of having outlets for different musical expressions and what the veteran producer is currently working on. He also hit us up with an incredible exclusive mix of deep, soulful tech-house that simply has to be heard to be believed. You’re quite the veteran of the house and techno scene. What was it initially that got you into DJing and producing? Norman Feller: Well I would say that initially when I started it was more of the rave stuff and hard trance music, but then in the middle of the 90’s I switched over to house music. I was very impressed with some house parties that were happening here near my home town in Frankfurt. The whole explosion of this music around Germany as well was so amazing for me, especially the grooves, the tempo and the funky rhythms of the house tunes gave me a lot of inspiration and that was the reason I switched over to this sound. I know around that time in Germany certainly the sound was generally a lot harder, more the techno and acid trance and all that. So was there a big scene for house and tech-house also? Yeah, in the middle of the 90’s I went to a lot of the parties of Ricardo Villalobos, who was doing these illegal parties near my home town. This was before he was a big name and there were DJs like Chez Damier and these other American DJs playing, and to go and see these DJs made a very big impression on me. Using the name Terry Lee Brown Jr., was that to make yourself sound like one of these American DJs or as an homage to them? Yeah, that’s really a funny story because when I started with that, my first thing I did was for Plastic City because I know the guys from there. So I started to produce my first Terry Lee Brown Jr. production, although of course I didn’t have this name yet. Because in the 90’s I had a lot of different names for different projects, I’m not sure exactly how many but I worked a lot with other friends so all the time we used different names. So when it came to doing the Plastic City release I was thinking on a name that would suit the sound, the model I had created. So I was writing down all these names I thought could work in my studio. Terry I liked because it could be male or female. Lee, I don’t know how I came up with that, and then Brown because an American friend of mine had this last name. So I called Alex, the owner of Plastic City and I told him the name and he suggested to add the Jr. part of it and it was done, it was brilliant. It wasn’t really my intention for it to sound like an American producer, but then a lot of my black friends from my hometown told me this was a pretty typical name for a black man to have from America. I didn’t really think anything of it, but then when my first album came out, it started getting a lot of positive response from American producers and they said they were very surprised when they found out that Terry Lee Brown Jr. was this white guy from Germany. My main thing was that I was trying to move away more from the techno things that I was creating in the early 90’s and make something more like house music, but it couldn’t help but still have some techno elements to it, so it became tech-house. This was also like what David Alvarado was doing, who was a big influence and a good friend of mine. Did you have any formal musical training? I can’t read notes, but I guess I do have a musical background. My father is a bass guitarist and he has been playing for about 40 or 50 years now in a rock ‘n’ roll band, but that was more as a hobby. But I think from him I got a musical understanding and appreciation. But for me to play keys and things, it is coming completely from my soul, just me feeling it; I have never had any teacher or anything like this. I just had a lot of good friends who were in the business as sound engineers and in studios, so I learned a lot of things about the other side of music too. For your whole career as TLB Jr. you have solely released on Plastic City. What is the reason behind this? I know you’ve released on other labels under different names. Was this partly due to a contract? Have you ever felt that you’ve limited the scope of your distribution by remaining solely on that label? In the beginning years it was because of an exclusive deal I had with them, but it was not a problem either, it was a very positive situation. At this time Plastic City was under the heading of Under Cover Music Group but it went under in the early 2000’s. So for a while it was in doubt as to what was going to happen to all of the many labels that were under UCMG, but then Plastic City was bought by someone else and I decided to continue with them because after all these years it was like a family situation. I was an artist and DJ for them and also like their strongest artist. It was very much like what Danny Tenaglia was for Twisted or TRIBAL America at that time for example. Of course things have changed a lot and yeah, for example I just signed something to a different label but almost all of my work except for my remixes have been for Plastic City. But yes, for the future I will be releasing on other labels too. Frank [Cochois, The Timewriter] and I have been friends for a very long time and have started making some music together and we will be starting our own label for this too. We did have two labels before in the past [the excellent Tonika and Driftwood labels] but now we have a new one and it’s very fresh right now, so we should hear from that in the next three to four months. So your aliases in the past were more for the purpose of working outside of your contractual obligations. Do you have any new handles you’re using now? Not yet. My main project for the last ten years has been Terry Lee Brown Jr. Apart from that, the more down-tempo stuff has been under the name Nor Elle and that has been released through Mole Listening Pearls. In the beginning this was also a parallel label of Plastic City but more fixed on the listening and down-tempo side of music. So for me it’s nice to have this diversity to play around with different kinds of rhythm, especially after I have finished a Terry Lee Brown Jr. album, then I can switch over to Nor Elle and make something completely different to that. From a very early stage in your career you’ve released albums. Was this to establish yourself as an artist or more to deal with the prolific amount of work that you were producing? I think for me every time it was very important to create these albums. And you know, I never really had a club hit as Terry Lee Brown Jr. like some of the other producers. But for me I was always trying to focus on the sound design, to make something arty and not just release for the sake of it. I had my sounds, my harmonies, my chords, my technical understanding of production and it felt very important to put this into albums. These days it is very sad because everybody is just downloading tracks and not many people are so into the whole album. For me I loved to have a whole album to listen to, whether it was CD or vinyl and have a booklet to read and get the whole experience of listening to something for about 80 minutes. It seems to me that the whole digital culture has changed not just how people are listening to their music but how it is being made. You used to talk about the sounds and how good things would sound and now it’s just all about tracks. Some of these have still very good production but then after two weeks nobody remembers it. I know it is very much part of the zeitgeist and there are some very good things about this digital age in terms of distribution and being able to create your own story outside of record labels. That part of things is not so hard for artists now. But then you look at how people get their music, too. I used always to go record shopping one or two days of the week and would spend up to four hours or so with my record dealer going through new music, but now everyone is sitting in front of their laptops scrolling through thousands of tracks online. Also I think this affects the club culture a little bit, too. This whole music scene is based on vinyl so I can’t see what these digital DJs are doing on the stage. For me it makes no sense to be talking about what [gear] a DJ is using because it should be all about the performance. It’s a two way thing, though, because even though so many people are supporting this they are at the same time crying out for vinyl DJs, so it’s very strange times right now. I do like some aspects of it too, that you can finish making something new and then send it to a friend or a DJ across the other side of the world and they can play it that night in the club and let you know how it went down, that is a big thing. You can now create tracks and they can become a hit in the same day, so there are positive and negative things on both sides. So tell me a bit more about the label you’re setting up with Frank. The label is going to be called Refine and we have everything set in place business-wise for starting it. The question now is the starting date which I think is going to be in the next few months, so then from there we can start creating the sound of the label and how we will continue as older DJs in the year 2011. Will that label be more for your own productions or will you release others on there too? No, it will definitely be for others too, because we have a lot of good friends who are producers and we want to make a nice network. But to start it will be our own productions and then we will open it up. Cool, so what can you tell us about the mix you did for us? That is a mix I did especially for you in my studio in one take and I just can say it is a good mix of my music taste with some new tracks and some older ones. When I play I don’t believe in just playing new things because the age of a track shouldn’t matter, so I really like to sometimes get into some older things for a while and refresh the crowd with that. But of course this depends on the crowd, I just like to make things different every time. OK, so we talked about the label already but what else can we expect from you in the next year? Well, I will continue also with my compilations like Terry’s Cafe and you will also hear more productions with The Timewriter, because even though we have had our studios side by side for the past 11 years we have only ever made I think five tracks together, which is not very much considering we see each other almost every day. It was usually just us listening to each others tracks and helping each other but not with actually making things together. So now we are doing that some more and you will hear more of our co-productions on our new label Refine and also for other labels too. Great, thanks very much, Norman. 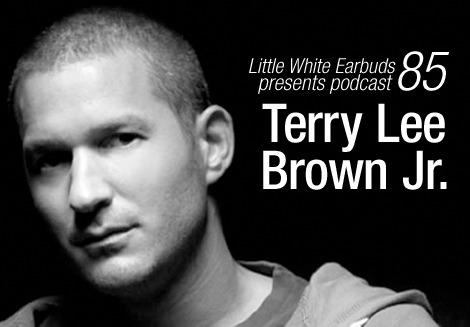 Tags: download, mutek, per, podcast, terry lee brown jr. So great to see TLBJr. with a mix and interview on LWE. Thanks so much for sharing this! Always loved TLB Jr’s sound. Interesting to hear his take on the name. I think somewhere along the line the racial deception was intentional. Perhaps some remember the caricature that could be found on some early releases? But all is forgiven. This guy has been so consistent with quality understated output for 15 years and I’ve been a fan for just as long. Considering how long as he’s been at it, he seems under-appreciated, so thanks for the interview LWE! Really have been enjoying this set, Top Shout out to you guys for putting this out there!!!!!!! Nice one.